Migraine Triggers for iPhone features information about migraine triggers and causes as well as fun and interactive games about migraines. Millions of Americans suffer from migraines. 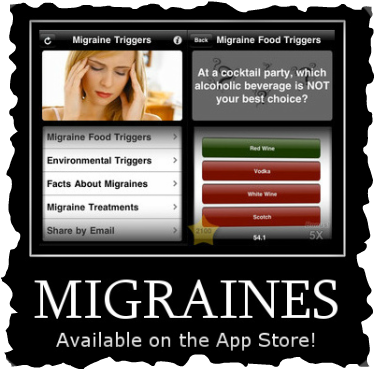 This app is designed to help them learn more about causing the onset of migraines, including certain food and environmental triggers. Ear Ringing Relief – How to effectively relieve yourself from ringing in the ear known as tinnitus! Dr Youngbing Shi, M.D., PhD. of the Oregon Health and Research Institute, recently evaluated the various forms of tinnitus treatment. His conclusion was that tinnitus management requires a combination of several methods. 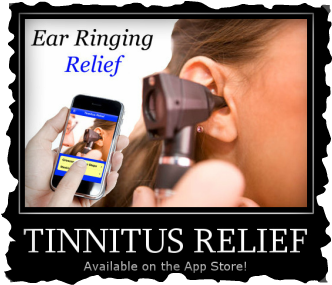 The Dr. Grossan Ear Ringing Relief app for the smart phone combines the known measures for tinnitus relief. Since 1974, Dr. Grossan has published the actions that have helped his own patients. His conclusion? When the patient understands WHY certain therapies work they can use them to their best advantage. Better sleep, Cognitive Therapy, Neuroplasticity, Medication Enhancement, stress free, masking, using your five senses, - these fields have been used successfully for Dr. Grossan's patients. When they are fully understood, and when a patient combines them in a manner best for him or her, then the body heals. Using the ear ringing relief app, you will quickly lay down new tracks, new connections to replace the unwanted ones. You will be assisted by Dr. Grossan's extensive experience. There are ten simple actions to do; although they are simple, it is when you FULLY understand how this works in your own body, that is when you get your relief from ringing in your ear. Why an app to relieve tinnitus? Think of learning a tennis serve. If you read about tennis, buy a tennis outfit, and listen to talks about tennis, will you become skilled at tennis? NO! You need practice and a coach. You need to use your muscles correctly.With this app, you will do the practicing. You have a coach, your mirror, Dr. Grossan and this app. Just as you need to practice your tennis to get to the Olympics, so you need to practice the known actions that give tinnitus relief. Knowing why this works, you will change your habits to good ones that keep you free of symptoms. Best of all you can grade yourself before and after and get a measure of your success. You can communicate with other app users as well as directly with Dr. Grossan. including the Hydro Pulse® Sinus Pulsatile Irrigator, Clear Ease® for diver's ear problems, as well as Breathe.ease XL saline and Nasal Gel. He has done 30 radio and TV interviews on his methods that utilizes the body's healing powers and is the founder of the Grossan Institute.